We have now been in our house for one month. How quickly that month has gone too. Most of our boxes have been unpacked, we still have a few that have a mish-mash of things in them, nevertheless we are feeling quite settled. There are still things that I want to do to make this place feel like my own. Every room needs to be painted, the basement needs carpet (to cover the asbestos tiles), and we decorations to hang on the walls. I know this will all happen over time, unless we win the lottery then I am going to go shopping immediately (I can dream, right?). I love this house and am really excited to see it transform into ours over the next year. One thing that I love about this house is that it is double the space of our previous apartment. Which means we actually have space to entertain, and I love entertaining. A couple weeks ago we had our first of hopefully many cocktail parties. Alex mixed up drinks popular in the 1960s and I made a bunch (too many) appetizers for our guests to enjoy. One of the appetizers I made was Swedish Meatballs. These particular kind of meatballs are typically served in a creamy brown sauce. You could eat Swedish meatballs as a main course served with mashed potatoes, but they make the perfect appetizer served on a toothpick. Enjoy as a tasty dinner with mashed potatoes or rice, or as a fun appetizer! Scoop up about 2T of the meat mixture. Roll into a ball (should be about the size of a ping-pong ball). Place the meatballs into a 9x13 baking pan. Bake for 10 minutes, turn meatballs, bake another 10 minutes. add the flour to the pan or skillet whisk until lightly browned, approximately 1 to 2 minutes. Gradually add the beef stock and whisk until sauce begins to thicken. Add the cream and continue to cook until the gravy reaches the desired consistency. Remove the meatballs from the oven, cover with the gravy and serve. 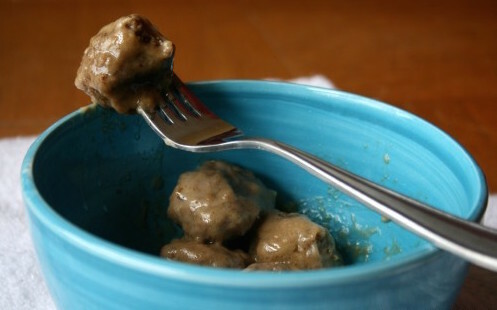 just had swedish meatballs for the first time at a party last weekend–woah! so good. i’ll have to give it a go sometime.